Super Mario Odyssey’s jump rope challenge is supposed to be a test of timing but a simple glitch has loaded the leaderboards with superhuman scores. 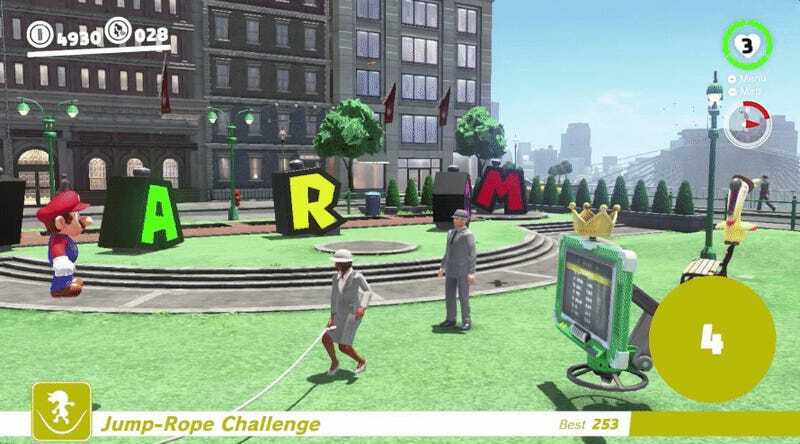 One of Super Mario Odyssey’s most addictive mini-games is the jump rope challenge found in the Metro Kingdom. Completing a certain amount of jumps without hitting the rope is a requirement for unlocking some of the game’s power moons and a leaderboard keeps track of the highest scores. Currently, the top ten shows absurd numbers maxing out at 99,999, with everyone tied for first place. But it’s not a matter of skill. With an easy-to-perform cheat, anyone can make Mario hover in the air and get a high score. The trick in question is the “talkatoo glitch” and it involves hitting and speaking to one of the hint-giving birds at the same time. This locks the camera in place and can interrupt animations. I was able to reproduce the glitch about in ten minutes. Some legends say he’s still there ‘til this day. In the grand scheme of things, this is a silly glitch that is probably more complicated to perform than simply doing the challenge and earning the power moons. Still, the glitch does toss the leaderboards into chaos. We’ve reached out to Nintendo to ask about a potential fix. Hopefully, the glitch can be removed and the leaderboards reset. That way we’ll get to know who really is-a the best and gonna win! I’m checking out the zombie-infested countryside of Days Gone with Heather. Join us in the chat!